Football looked a whole lot more like football one hundred years ago than it did the first time Auburn took the field in 1892. Still embryonic, I guess, but in 1914 you could definitely make out the hands and legs and the face of the sport it would grow up to be. Players had been allowed to throw it to guys in front of them for eight years, touchdowns had just been bumped up to six points instead of five, this whole “end zone” concept was starting to catch on. Times, they were-a-changin’. 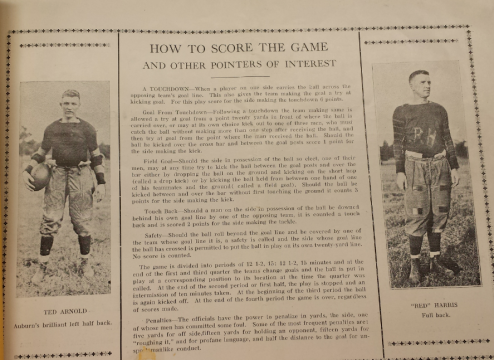 But it’s still pretty wild to read the “How To Score The Game And Other Pointers Of Interest” section printed in the back of 1914 Auburn football programs. In 1914, you still had to take up an entire program page to explain to people what they were even looking at. Take the Goal From Touchdown, the ancient equivalent of the extra point. When Auburn scores its first touchdown 10 or so seconds into the Arkansas game, Daniel Carlson is going to kick it from, what, the three-yard line, right? Or I mean, that’s where they put it, right? And right in the center? Well, in 1914, things weren’t so simple. A century ago you actually had two kicking options. The first is the one most like what we’re used to seeing. 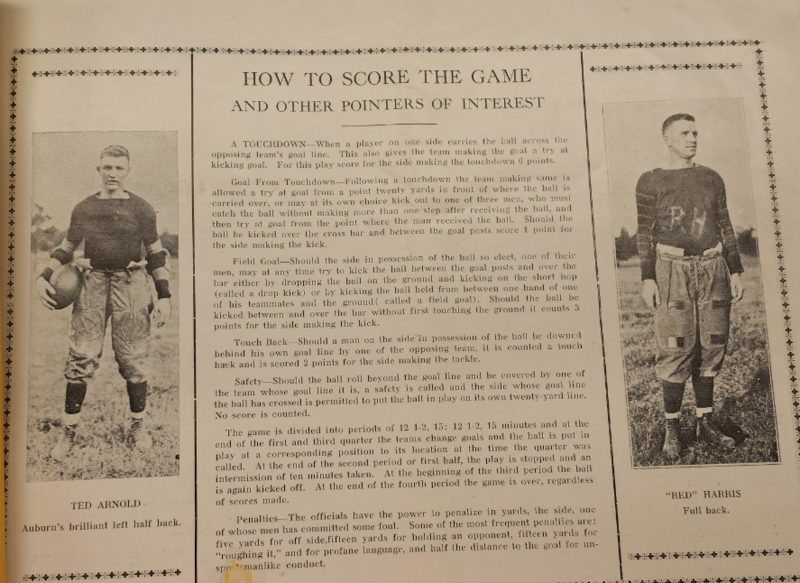 Only instead of the three, the ball was placed on the 20, but not from the center of the 20—20 yards out from where the ball crossed the goal line. That touchdown where Cam just bowls over the Arkansas linebacker? Wes Byrum would have had it 20 yards out on the left hash mark. But that iconic Superman touchdown in the South Carolina game? That’s one heck of an angle, even for Foot Lauderdale, which is why you’re always reading this stuff back then about teams “kicking out” after touchdowns. If 20 yards up from the spot where you crossed the goal line was too sharp, a team was allowed to have a player pooch it from that spot on the goal line to one of three players placed in locations more advantageous for a kicker to get the ball through the uprights. The only catch, as it were, was that whomever caught it couldn’t take more than one step after securing it. If you made it that far, then the player who caught it could try to kick it through. Wild stuff. Safety—Should the ball roll beyond the goal line and be covered by one of the team whose goal line it is, a safety is called and the side whose goal line the ball has crossed is permitted to put the ball in play on its own twenty-yard line. No score is counted. Other “pointers” of interest: Only the second and fourth quarters were 15 minutes. First and third were, for whatever reason, just 12 and a half minutes. Halftime was ten minutes. Cussing could cost you 15 yards. And you’d really want to avoid good ol’ unsportsmanlike conduct–which apparently was stuff even worse than profane language and “roughing it”. The penalty was half the distance to the goal, no matter where you were. However, judging by the accompanying photo of Auburn fullback—not Right Halfback—Red Harris, there apparently was no penalty for painting your initials on your jersey. Related: According to John Heisman, Auburn was ‘the first to show what could be done’ with the hurry-up offense.